25 April 2012: In a country more recently characterised by stability, progress and prosperity, despite a recent downturn in its economic fortunes with a few knock-on social effects, the Japanese system of local government has bedded down well as part of the post-war constitutional settlement, with the guarantee of local autonomy enshrined in its constitution. As with other aspects of Japanese society, there is an appreciable level of civic pride among many people and interest in community affairs remains strong. Japan’s system of local government, in place for over half a century, is relatively straightforward to understand, though it does not hit the headlines outside of Japan very often and is therefore not understood by many in the local government community internationally. Japan has been regarded as one of the world’s leading economies for several decades and today plays an increasingly large role in international affairs following several years of post-war isolation. In the media and in other arenas, government affairs often take a prominent role in a country renowned for its socialised approach to community affairs. Local government is no exception to this. Local government enjoys specific legal status in Japan’s legal framework, specifically through the ‘Local Autonomy Law’, which was promulgated in 1946. The principles of this law involve a respect for local self-government, the separation of the executive and legislative branches and the definition of local councils and their status in relation to central government. This system is very much influenced by the American model, an obvious consideration given the United States’ role in administering the country in its post-war reconstruction era and the presence (like in the US) of elected executive mayors as the underpinning for city government. Furthermore, local government in Japan is structured along two-tier lines  prefectures (comparable to counties) and municipalities (comparable to cities and towns). While the prefectures and municipalities enjoy considerable levels of autonomy in the fields of administration, budgetary matters and local legislation/bylaws, Japan is a unitary state with no reference to federal structures in its constitution. The prefectural system was bequeathed to Japan from earlier societies before the country began its nation-building in the 19th century. Each prefecture has its own elected executive Governor. Some 47 in number, this has not altered since the Meiji period (1868-1912) and these units are thought to have come into creation as a result of the Shogunate structures that existed during the Edo period of feudalism which began in 1603. As such, prefectural boundaries and identities are rigidly enshrined in most aspects of Japanese society, governmental or otherwise. Japan’s modern municipal system, on the other hand, is a much more recent creation, having resulted from the wave of mergers promoted by central government in the early 1950s, which saw their number decrease by 50 per cent. In part, this development was driven by the need for increased autonomy but more importantly by rapid urbanisation that followed the country’s post-war reconstruction. It is worth noting that Japanese local government is tasked with responsibilities that would be normally be the domain of central government in many other societies. In particular, local government is burdened with responsibility for social insurance and healthcare, with prefectures and municipalities acting alongside central government in the delivery of what constitutes Japan’s welfare state. Some demarcation takes place between the various tiers  for instance, municipalities are responsible for basic healthcare provision while the prefectures administer hospitals. Roads are designated National Expressways, National Highways, Prefectural Roads and Municipal Roads. Development control is another contrast. While local government has a role to play in strategic planning, development control is considerably more light touch in its approach. Local government is also responsible for police and fire service matters and disaster management, which assumes an important role in national life. The police forces are administered through prefectural Public Safety Committees while the fire services are a municipal concern. In terms of education provision, local boards of education are organisationally independent from local councils but are appointed by Governors and Mayors with council approval. Structurally-speaking, the system of local government in Japan is largely uniform in comparison with the UK or the US, with each of the municipalities being headed by an directly elected executive mayor and also having an elected municipal assembly, with these features being replicated in the case of the prefectures though with different nomenclature. The only exceptions to this are the 20 designated cities, which enjoy more autonomy than basic municipalities and Tokyo, which as the nation’s capital has the special arrangements of having an elected Metropolitan Government headed by a Governor and 23 Wards as sub-councils for the central Tokyo area. Under this arrangement, the division of responsibilities that usually takes place between prefectures and municipalities is different. The activities of Japanese local governments are funded from a basket of varied taxes, with Japanese people having a considerable tax burden for the services they enjoy. For instance, the prefectures are able to levy taxes on tobacco consumption, fuel, car purchases and a general sales tax, while the municipalities can levy property, residency and city planning taxes. The personnel in Japanese local government are known as local civil servants and enjoy the same security of tenure and status as their national counterparts. It is usual for local civil servants to remain with the same local authority for their working lives, which is a direct contrast to the fixed-term contracting taking place in Britain more recently. However, an exchange scheme between central and local government, as well as between the tiers of local government, allows for civil servants to be seconded elsewhere ensuring their working lives are varied to some extent. Japan operates on a three-yearly cycle whereby every April employees shift between departments in their organisation, with winners and losers in the promotion rounds. Those who make up the assemblies at municipal or prefectural level, not to mention Mayors and Governors, often come from such a background. Councillors are elected for four year terms and are restricted from holding other public office or working as a local civil servant. Although Japanese local government features an absence of party discipline characterised by a comparably high number of Independent candidates elected, councillors tend to come from one of the political parties, such as the Liberal Democratic Party or the Democratic Party. Today, local government in Japan enjoys the same levels of local autonomy that existed in its constitutional heyday, but in a changed political climate, as is the case in other developed societies. National financial pressures dictate that local services have to become more accountable for the funds they spend. 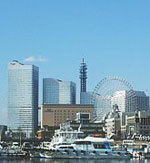 The national budget for 2004/05 called for 1 trillion Yen to be trimmed from local government spending. However, the government prefer to couch this in the language of 'decentralisation'. In short, this means more mergers and more reliance on the private sector. Japan has experienced periods of municipal mergers before  in the late 19th century when almost 70,000 municipalities were amalgamated into 15,000 units and in the post-war period referred to earlier. Today they stand at 1,719. As part of the so-called 'Trinity Reforms' of the Koizumi administration, while decentralisation was coupled with municipal mergers to achieve more efficiency and economies of scale, the next step envisaged would appear to be more uncertain. Currently the number of upper-tier prefectures is settled and unchanged at 47, though central government is spying the creation of nine to 13 regional-tier governments to handle services currently administered at this level. While the debate is on-going and certainly contentious, the legislation now exists for it to both decentralise and regroup the upper tier along regional lines. The 47 prefectural boundaries are set and accepted across the board, yet creating regions without definite boundaries (other than island groups) will remain an issue. In December 2006 central government began with a pilot for the island of Hokkaido, which stands apart from the Japanese mainland and was the last prefectural unit to be admitted to the then empire-based system. Other political currents inform debate in Japanese local government. Japan is faced by an ageing population, faster than anywhere else in the world. As such, local government must consider how its welfare capacity and housing policies can take this into account. Local government is also moving more and more into the cultural services field and the promotion of tourism has become paramount in stimulating the economy, particularly in Tokyo. Japanese local authorities also place great emphasis on their international links, which in an increasingly global society should be of interest to all concerned with the future of local government. 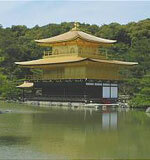 The Golden Temple in Kyoto. Kyoto was Japan's capital and the emperor's residence from 794 until 1868. It is now the country's seventh largest city with a population of 1.4 million people.